Acer got a few things right and a number of things wrong with the Predator (specifically, Predator model AG3620-UR12). On the “right” side of the ledger, it has one of Intel’s better processors—a 3.4GHz Core i7-3770—and 32GB of DDR3/1600 memory. With those components, the asking price of $1299 is very reasonable. On the “wrong” side of the ledger, the Predator has an AMD Radeon HD 8760 video card (the OEM version of the milquetoast Radeon HD 7770), a chintzy custom motherboard with just one PCIe x16 slot (occupied), and a miniscule 16GB SSD that serves as a cache to the 2TB, 7200-rpm mechanical hard drive. Don't buy the Predator if you plan to do much in the way of upgrading down the road. There's just not much room inside the case. The all-steel case is wrapped in painted satin black, with glossy black accents on top. Three doors in its face flip down to reveal 5.25-inch drive bays. Of these, one is occupied by a 16x DVD burner, and a second has a slide-out tray with SATA power and data connectors in the rear of the bay. Though this isn’t a hot-swappable drive bay, it does provide an opportunity for data backup that you can remove to an offsite location. This slide-out drive tray is a cool idea. While not a hot-swappable bay, it has SATA data and power connectors at its back. 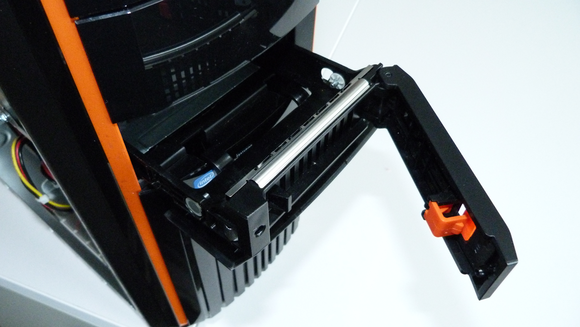 Also included are two empty 3.5-inch drive bays (accessible only from inside the case), but you’ll need to supply your own SATA cables and Molex-to-SATA power adapters if you decide to populate them (leads from the 500-watt power supply are available). 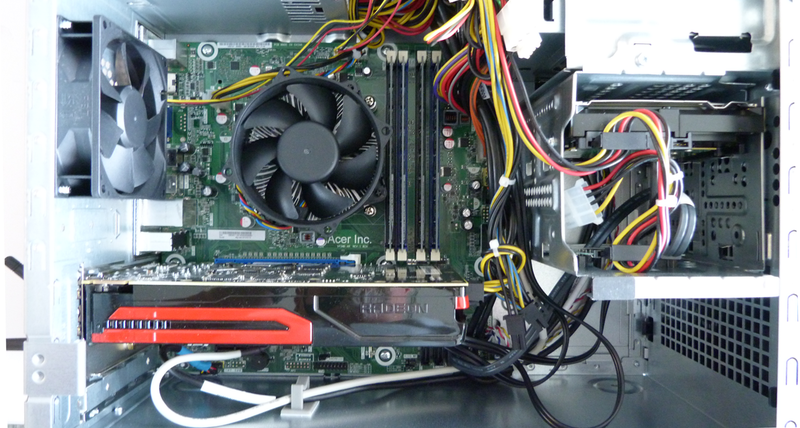 The top of the case has a media-card reader, two USB 3.0 ports, and two USB 2.0 ports. You’ll find two more USB 3.0 ports and four more USB 2.0 ports in back. The video card has three connectors, one each for DVI, HDMI, and DisplayPort (full-size), and I was surprised to see antennas for a wireless network adapter card (802.11b/g/n, plus Bluetooth 4.0 support) sticking out from the back. That’s a nice touch, although I imagine having the antennas near the floor must really cut the adapter’s range. 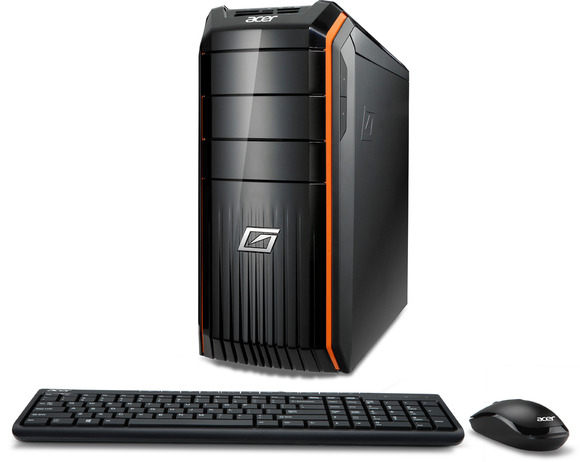 Acer pitched this machine as a “take no prisoners” gaming rig, but the benchmark results belie that claim. While the Predator did produce a Desktop Worldbench 8.1 score of 227, the system we use to establish our 100-point baseline is an unassuming all-in-one desktop PC powered by an Intel Core i5-3230M, with integrated graphics and 6GB of DDR3/1600 memory. The Predator can deliver Crysis 3 at 60 frames per second, but only if you’re willing to reduce the game’s resolution to 1024 by 768 pixels and clamp its image quality at low. When we tried playing the game at the native resolution of a typical 23- or 24-inch consumer monitor—1920 by 1080 pixels—and boosted image quality to Ultra, the Predator delivered a slideshow-like performance of just 6 frames per second. We had a better experience with Civilization 5 and DiRT Showdown (the latter at Ultra quality level), achieving 28.2 and 31.6 frames per second respectively at a resolution of 1920 by 1080. The Predator is a better-than-average family PC, but hard-core gamers will find it to be weak tea. The Predator just isn't as ferocious as Acer would like us to think it is.